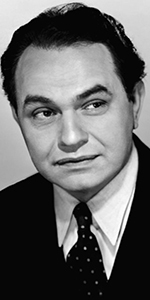 Edward G. Robinson; unknown date. Edward G. Robinson was another unforgettable actor from the 1930 and 1940s. Small, pugnacious, odd-looking, and fast-talking, Robinson enbodied a attitude many people could relate to, spawning a legion of imitators. Born to Yiddish-speaking Romanian Jews, the Goldenbergs emmigrated to America in 1903, after a son was attacked by an anti-semetic mob. The family located in the Lower East Side of Manhattan, where Emanuel was Bar Mitzvah'ed, went to high school, and attended City College with the intention of becoming a lawyer. But his interest in acting and performing led to a dramatic scholarship; the young actor changed his name to Edward G. Robinson. Starting out in the Yiddish theatre, Robinson made his Broadway debut in Under Fire during the 1915-1916 season. Robinson spent the next fifteen years on Broadway, working in supporting and featured roles in moderately successful plays, including playing the role of Von Eberkopf and the Button Molder in Ibsen's Peer Gynt in 1923. That same year, Robinson did his first movie, The Bright Shawl (released in April, 1923, by First National). By 1927, Robinson was starring on Broadway in a play about gangsters called The Racket, which led to his being cast in gangster roles in films. His odd persona and his ability to deliver complicated dialog convincingly, made him much in demand during the early sound period, receiving major roles in Night Ride (released in January, 1930), Outside the Law (released in September, 1930), and East is West (released in October, 1930). Robinson's breakthrough performance came in Little Caesar (released in January, 1931), after which, Robinson became central to the Warner Bros. program of fast-talking, topical dramas, such as Smart Money (released in July , 1931), Five Star Final (released in September, 1931), Tiger Shark (released in September, 1932), Barbary Coast (which played the Chinese in October, 1935), Kid Galahad (released in May, 1937), A Slight Case of Murder (released in March, 1938), and The Amazing Dr. Clitterhouse (released in July, 1938). Robinson played an FBI agent on the hunt for Nazi's in Confessions of a Nazi Spy (released in May, 1939); Robinson became a public, and outspoken critic of the Nazi Party. His film work contimued unabated: Dr. Erlich's Magic Bullet (released in March, 1940), A Dispatch from Reuter's (released in October, 1940), The Sea Wolf (released in March, 1941), Manpower (released in August, 1941), and Larceny, Inc. (released in May, 1942). Volunteering for service in June, 1942, he was turned down for being too old (48). Robinson campaigned tirelessly to sell War Bonds, and was among the first entertainers to appear before troops after the Normandy invasion. Like many celebrities who supported the war against the Third Reich, Robinson was very much pro-Soviet (although an anti-communist). Robinson was the oldest of the five actors from the film Tales of Manhattan to be imprinted on the same day at Grauman's Chinese. Tales would have its world premiere two weeks later, in August, 1942. Robinson kept busy during World War II. Some of his key films were: Double Indemnity (which played the Chinese in August, 1944), The Woman in the Window (released in November, 1944), Scarlet Street (released in December, 1945), The Stranger (released in May, 1946), the film version of All My Sons (released in April, 1948), and Key Largo (released in July, 1948). Because of his failure to dennounce Stalin during World War II, Robinson was called before the House Un-American Activities Committee, where he became a friendly witness, but even so, work at the major studios began to slow for him. Robinson, like many others, did a lot of television: he played the lead in a version of Witness for the Prosecution on the Lux Video Theatre in 1953, appeared on Climax! in 1954, Celebrity Playhouse in 1955, The Ford Television Theatre in 1955 (twice), Playhouse 90 in 1958, Goodyear Theatre in 1959, Zane Grey Theatre in 1959, The General Electric Theatre in 1961, The Detectives in 1961, The DuPont Show of the Week in 1962, Medical Center in 1969, Bracken's World in 1969 and 1970, and Night Gallery in 1971. The left-leaning, art-collecting, music-loving Robinson was finding it difficult to obtain work in the Blacklist Era, but in an odd twist, he was cast as Vincent Price's lickspittle in Cecil B. DeMille's second version of The Ten Commandments (released in October, 1956). After which, he enjoyed more work on the big screen: A Hole in the Head (released in July, 1959), Seven Theives (released in March, 1960), he played Theodore Roosevelt in the T.V. Movie The Right Man (aired in October, 1960), My Geisha (released in February, 1962), The Prize (released in December, 1963), Good Neighbor Sam (released in July, 1964), Cheyenne Autumn (released in October, 1964), The Cincinnati Kid (released in October, 1965), Mackenna's Gold (released in May, 1969), and Song of Norway (released in November, 1970). Robinson gave his last and perhaps most poignant performance, dying to Beethoven's Pastorale in Soylent Green (released in May, 1973). He died of bladder cancer shortly after finishing his part in the movie at the age of 79. Grauman's Chinese Theatre, Hollywood, California. Edward G. Robinson Forecourt ceremony, Friday, July 24, 1942. 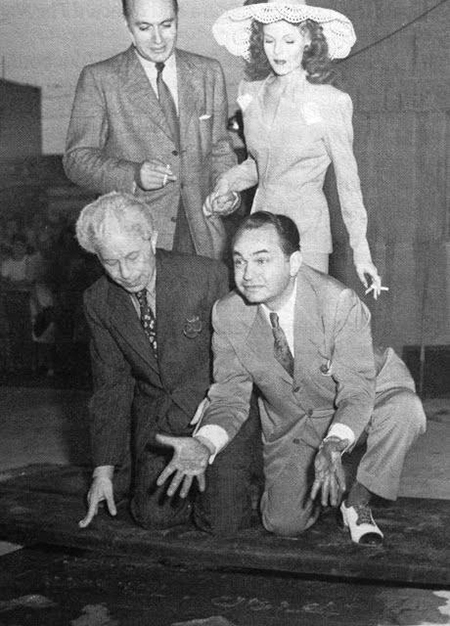 Charles Boyer and Rita Hayworth (standing), and Sid Grauman observe as Edward G. Robinson displays his dirty hands. Grauman's Chinese Theatre, Hollywood, California. Edward G. Robinson Forecourt ceremony, Friday, July 24, 1942. 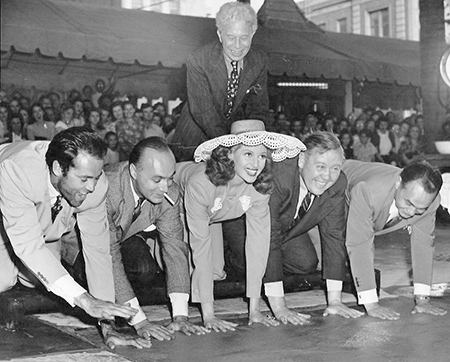 Sid Grauman presides over the co-stars of the film Tales of Manhattan: Henry Fonda, Charles Boyer, Rita Hayworth , Charles Laughton, and Edward G. Robinson.